The eighth island, Santa Catalina Island, is run by the Santa Catalina Conservancy. Members of the All Eight Club include biologists, anthropologists, botanists, ornithologists, zoologists, educators, helicopter and fixed wing pilots, a retired National Park superintendent and park employees, a museum director, a lichenologist, a photographer, a retired judge, and a sea captain. This is said to be the most exclusive recognized geographic club in the world, with membership in the low 100s—a tenth of the famous 7 Summits Club. Membership benefits include an “All Eight California Channel Islands” baseball hat and a membership certificate. Qualified persons are invited to apply. Click here for the All 8 application. Photographic proof may be required. 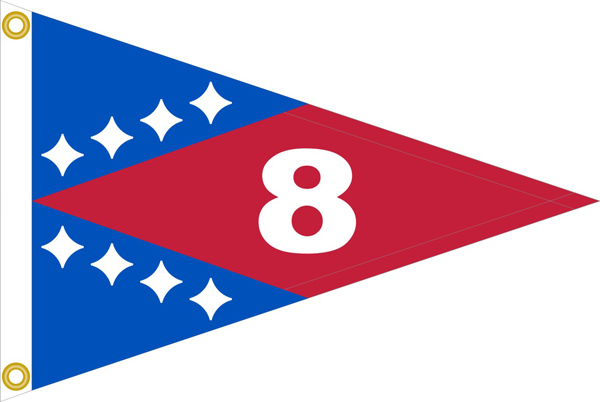 The flag’s eight white stars, set in two groups, represent the four Northern and four Southern California Channel Islands.